surface mount with the optional approach ramp. Engineered and designed for maximum safety and efficiency. Checkered plate deck is made of heavy gauge steel for years of use. Hydraulic cylinders feature emergency velocity fuse if line breaks. Complete with upper travel limit switch and overload relief valve. Push-button control is 24V AC on a 20 foot long coil cord. Pre-wired control box includes magnetic starter and overload fuse. High visibility removable handrails with fixed toe-boards are standard. Includes beveled toe-guards and electric toe-guards around perimeter of platform. External 6.5 HP 208-230/460V, 3-phase, 60 Hz motor may be located up to 8 feet away from lift. OSHA and ANSI compliant. SPLIT ALUMINUM TRUCK BRIDGE: Standard steel bridge can be replaced with an aluminum bridge 72" wide x 18" long. Ideal for government applications. Model WL-SATB. SPLIT STEEL BRIDGE: An additional split steel bridge can be added to opposite side of unit. 72" wide x 18" long. Model WL-SSTB. 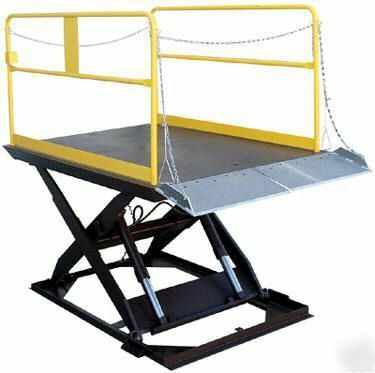 REMOVABLE HANDRAILS/TOEBOARDS: When mounting this lift in a pit, this option allows platform to be flush with the floor for fork truck cross traffic. Deduct 71?2" from overall width for usable width. Model WL-RHT. WARNING BEEPER & STROBE: Sounds and flashes during lifting and lowering operations. 80 decibels. Model WL-WB. APPROACH RAMP FOR 8" LOWERED HEIGHT LIFTS: 60" wide x 65" long. 7° ramp angle. 308 lbs. Model WL-AR8. APPROACH RAMP FOR 10" LOWERED HEIGHT: 60" wide x 82" long. 7° ramp angle. 395 lbs. Model WL-AR10. APPROACH RAMP FOR 12" LOWERED HEIGHT: 60" wide x 98" long. 7° ramp angle. 474 lbs. Model WL-AR12. 50,000 lbs. ROLLOVER CAPACITY (25,000 lbs. per axle): Add'l structural channel and supports for deck. Increases lowered height 2". Model WL-50. MOBILE WHEEL KIT: Kit may be used on the 5,000 and 6,000 lbs. capacity units only. System includes a dolly jack. Model WL-WK. SPECIAL RESERVOIR MOUNTING: We can fabricate a platform for your power unit if motor cannot sit on the ground or if unit is portable. Model WL-RMB. AUTOMATIC WHEEL CHOCKS: As the unit lifts, this option will block dock end of ramp to avoid roll off. System requires a special pit mount. Model WL-AWC. STOP SIGNAL SIGN: As the truck approaches the lift, the sign raises to let the driver know when to stop for safe loading/unloading. Model WL-SSS. KEY LOCK OPERATION: To avoid unauthorized use of the lift, this option will lock out the controls. Model WL-KL. TWO SPEED PUMP: Increase lifting speed by 55% when lift is unloaded. Ideal for unloading applications. Model WL-TSP. 2 HP SINGLE OR THREE PHASE ELECTRIC MOTOR: Consult factory for lift speeds. Both internal and external power units available. Model WL-2HP. 3 HP SINGLE PHASE ELECTRIC MOTOR: Replace standard three phase power unit with 208/230V, 1 phase, 60Hz power unit (11?2 gallons per minute pump speed). Model WL-3HP. 7-1/2 HP POWER UNIT: Power unit is wired for three phase 208-230/460V 60Hz, unit will pump 6 gallons per minute. Model WL-7HP. 10 HP POWER UNIT: Power unit is wired for three phase 208-230/460V 60Hz, unit will pump 8 gallons per minute. Model WL-10HP. GALVANIZED COATING: Cold galvanized coating designed for washdown applications and wet environments. Model SPO-WL-LS-ZRC. STEEL-IT™ COATING: Designed for incidental food contact and washdown environments. FDA approved. Model SPO-WL-LS-SSC. OIL HEATER: For cold weather applications. Unit supplied with thermostat for automatic heat control. 208-230V single/three phase power. 350 watts. Model WL-H2. OIL HEATER: Same as above; to be used with 460V three phase power unit, 0.75 amps 350 watts. Model WL-H4. Shop With Confidence!Hayes Trading Co27W403 Chartwell, Winfield, IL Incorporated In The State Of Illinois Questions: Just send an email to or click on "Ask seller a question. "Be sure to add us to your favorites list! If we make an error in your order, request a return authorization (RA#) from us via email, fax, or phone. We will send you an approval notice for your return. Any merchandise authorized for return must be new, complete, and in saleable condition. A copy of our original invoice and the Return Authorization number (provided by us) must be included.